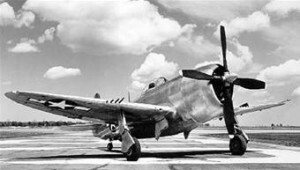 On the afternoon of May 28, 1944, 2nd Lieutenant William A. Benson, was piloting a P-47D Thunderbolt, (Ser. No. 42-74853), as part of a four aircraft, high altitude, training flight. Soon after take off from Bradly Field, Lieutenant Benson radioed the flight leader that he had gasoline coming into his cockpit, and he was cleared to return to base. At this point the flight was about ten miles distant from Bradley Field. Lieutenant Benson called for an emergency landing and was given clearance by control tower personnel. It appeared to those in the tower that Benson’s aircraft was making a normal approach to the runway, when flames suddenly erupted from the right side of the engine and then engulfed the cockpit. The aircraft then nosed over and crashed and exploded 200 yards short of the end of the runway. Lieutenant Benson had received his pilot rating on March 12, 1944. Lieutenant Benson is buried in Forest Lawn Cemetery, in Saginaw, Michigan. To see a photo of Lieutenant Benson, go to www.findagrave.com, Memorial #99788097.